Chris Garcia owner of Mission Plumbing & Heating followed his father’s footsteps. 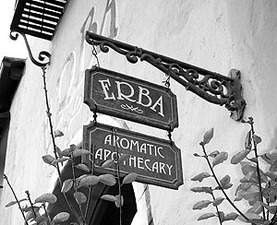 The beautiful new (since July) Erba Home store on Avenida Del Mar, Main Street, San Clemente is a customer-demanded spin off of the fragrant Erba store also on Del Mar. And they share many similarities. Owners, Lisa Rodarti and Marina Goffredo are women of Italian descent who chose the Italian word for “herbs” to incorporate into the name of the first store, Erba, when they opened it four years ago. Now, the new store, Erba Home, located in the former “Cheers” store location on Avenida Del Mar, carries the same first name as well. Marina Goffredo.Being unique is also important to the partners. Lisa remarks, “Other stores might have products similar to what we offer, but you’ll find that our offerings are unique and not found elsewhere in this area. 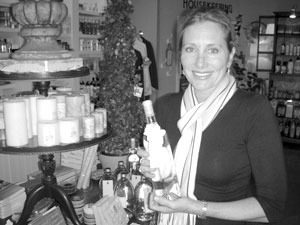 In fact, no one has the array of home spa treatments, aromatic candles, European soaps, body lotions, hand care items and innovative paper products that Erba carries, or the fabulous home interior products that we offer. You won’t find better quality products, and yet we keep prices down. “If a product is unique and offers excellent quality, fits our motif and it’s gorgeous, we order it. But we do that only if we think that our customers who work hard for their money will find it in the realm of reasonably priced. In other words, our products are not only beautiful but they are economical and are produced to last. Here’s a tip…visit Erba, and ask to see the newly created browsing room that is solely devoted to cards and paper goods of all kinds—-invitations, imprintable note paper, journals, brag books, stamps, letter press note papers, cards, wax stamps, embossers and much more. Or, see different collections at Erba Home.